One of the more important trends in the energy efficiency business is the evolution of deemed savings and how deemed savings have been presented. Some of the earliest efforts to standardize prescriptive program offerings were the emergence of the California Deemed Energy Efficiency Resource (DEER) database in the 90’s. Now, there is a strong movement to develop more detailed guidance documents often referred to as Technical Reference Manuals (TRM). The evolution of TRMs has happened rapidly over the past five years. 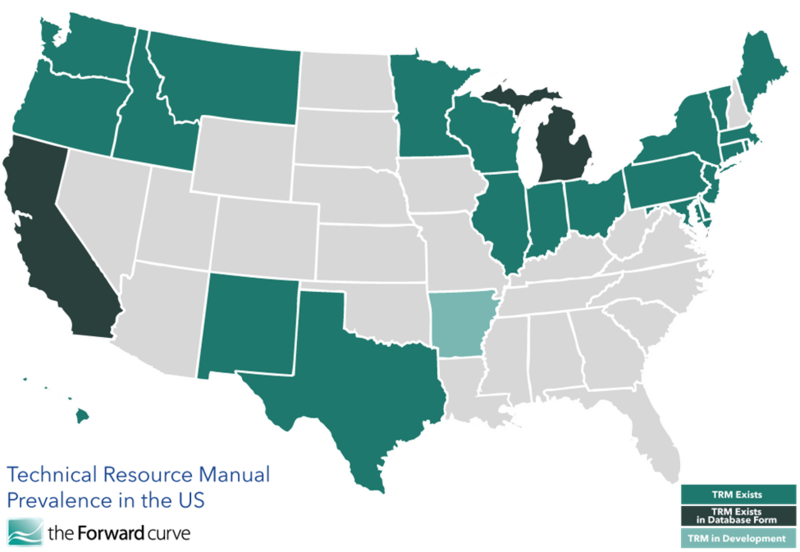 With less than 10 state specific deemed savings efforts in 2010, there are now over 20 jurisdictions that have adopted some form of a deemed savings guidance document. The purpose behind a state-specific TRM, or similar tool, is sensible: to achieve consistency across utilities on what values should be used to identify energy or demand savings for prescriptive efficiency measures on a “per unit” basis. The methodology used to quantify that value is where careful deliberation and thought is required. ● Fully Calculated Algorithm – Parameter values based on specific measure installation information are needed as input to savings algorithm. The method used is based on several factors, including how well energy savings for that particular measure are understood, the consistency of application, the depth of any field studies, and the complexity involved in the application of the measure. Regardless of the approach used, the methodology used to identify a fully deemed, partially deemed or fully calculated algorithm must be transparent on the approaches used to identify critical parameters. For building envelope related measures such as wall and roof insulation, sophisticated modeling results will be used to determine those parameters with modeling inputs identified in an appendix as supporting documentation. Some examples of this approach can be seen in the New York and the Arkansas TRMs. For emerging technologies, such as Smart Thermostats, Kitchen Ventilation Controls, and Door Gaskets, field-study data will typically be used as the basis for determining appropriate inputs. This data will either be used directly or modified for regional effects. As TRM efforts spread across the United States, the industry has used a practical approach in developing TRMs by borrowing savings calculations from other states. Eventually, this may lead to some energy savings being more consistently applied across the country. What we have found, though, is that what works in one region may not necessarily work in another region. Caution needs to be applied when incorporating methodologies used from different TRMs. This phenomena was well-researched and documented in the 2011 SEE Action report “Scoping Study to Evaluate Feasibility of National Databases for EM&V Documents and Measure Savings.” Commonly addressed measures were compared in different jurisdictions including the methodologies and parameters for calculating prescriptive measures. The report concludes that differences in construction methods, variations in climate, history of prior energy efficiency efforts, and other factors are important to consider when considering the use of TRM content from one state to another. With this rapid evolution of TRMs, practitioners have found that TRM documents should be periodically reviewed and updated to not only ensure relevance but to also maintain compliance. In some jurisdictions, such as Arkansas, Texas, and Illinois, the TRM is reviewed on an annual basis to account for changing markets and other conditions. New York has established an annual cycle for revising existing measures, while allowing new measures to be included on a quarterly basis. Stay tuned as we continue to review trends and best practices in the development and interpretation of TRMs. See below for a current status of TRMs or for ongoing updates by state, go to: http://database.aceee.org/state/evaluation-measurement-verification.